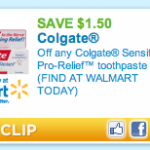 New $3 Schick printable = $1.99 after coupons at Rite Aid next week! 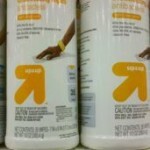 You are here: Home / printable coupons / New $3 Schick printable = $1.99 after coupons at Rite Aid next week! 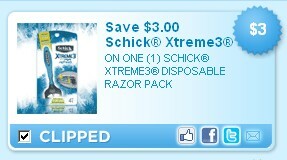 Hurry and print this new $3/1 Schick Xtreme3 Disposable razor coupon! It was just added this afternoon, but these printables have been disappearing quickly lately, so you don’t want to miss it! 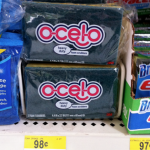 If you have a Rite Aid in your area, you’ll be able to grab these Schick Xtreme 3 razors for just $1.99 after coupons next week! 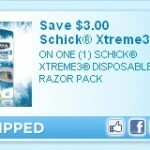 Schick Xtreme3 razors as low as $1.99 each after coupon! Print & Hold: Garnier Fructis Hairspray $1.24/each after coupon at CVS! Mitchum printable: Moneymaker @ Rite Aid this week, free @ Walgreens next week!